This Quick Indian Chicken Curry recipe is spicy, super easy to make and ready to eat in just 30 minutes. Serve with rice or naan bread for a hearty, satisfying meal. You are going to love this thick, rich curry made with tender, juicy pieces of chicken. It is ideal for busy weeknights because it delivers maximum flavor in minimal time. Normally when you read Indian recipes, they include a large number of spices in the ingredient list that many people don’t readily have on hand. So, I developed a recipe that uses curry powder, which contains a bunch of fragrant spices that have been ground up and mixed together in one handy package. This curry recipe uses evaporated milk, rather than heavy cream, to add creaminess and to tone down the spices a bit. Evaporated milk adds almost the same creaminess, but with much less of the fat and calories than heavy cream. I am a big believer in using no-hormones-added and ethically-raised animal protein instead of conventional, factory-farmed meat. It’s more humane, sustainable and it’s higher in quality – which means its healthier to consume and also tastes better. However, it can be difficult to find healthy, organic meat. So, I highly recommend using an online retailer that I love: ButcherBox! ButcherBox is a popular monthly meat delivery service that delivers high quality, antibiotic- and hormone-free cuts directly to your door. Their meat selection includes free-range chicken, 100% grass-fed and grass-finished beef, and heritage breed pork. If you are having a hard time finding tasty organic meat near you – or if you want to avoid shopping and traffic AND get top-quality meat delivered right to your door while you’re at it – then you have to try ButcherBox. Alright, let’s get back to what you came here for: My Quick Indian Chicken Curry recipe! This recipe freezes really well, so you could make a bit batch and then store some (or all) of it in the freezer. 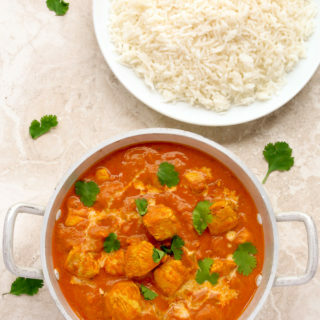 That way you can have chicken curry on-hand and ready to go on evenings when you don’t have time to cook dinner. Just remember to transfer it to the fridge a day or so in advance, so that it has time to defrost. Serve this rich, flavorful curry over steamed basmati rice or with warm naan bread for a complete, satisfying dinner when you are in the mood for something exotic. Food Chopper – This is the one I have and it is one of my most-used kitchen tools. I use mine all the time to quickly chop up vegetables. I especially love using it to dice onions, because it saves me from all the tears! This Quick Indian Chicken Curry recipe is easy to make, spicy and ready to eat in just 30 minutes. Serve with rice or naan bread for a hearty, satisfying meal. In a medium bowl, add the chicken, lemon juice, 1 tablespoon of olive oil and 1 tablespoon of curry powder. Toss to coat the chicken. Set aside to marinate while you prepare the other ingredients. In a large pot, heat the remaining tablespoon of olive oil over medium heat. Cook the onion for 4 minutes or until softened. Add the garlic and ginger and sauté for 1 minute until fragrant. Add the chicken and cook for 3 - 4 minutes until almost cooked through. Stir in the crushed tomatoes and remaining tablespoon of curry powder. Bring mixture to a boil, then reduce the heat to low, cover and simmer for about 10 minutes or until the chicken is completely cooked through. Stir in evaporated milk. Season with salt and pepper to taste. For a complete meal, serve with hot cooked rice or naan bread. This was delicious! I was honestly surprised that with just curry powder for spices it could be this flavorful. I’ve tried other curry recipes with a million different ingredients and I like this one better! Will definitely be making it again! What are the ingredients for curry powder please?